The end is near, kittens. The sleeves are knit and while the picture isn’t terribly clear, they go just past my elbow. The back is almost complete; I have about 10-12 rows of ribbing left to do and a cast off. 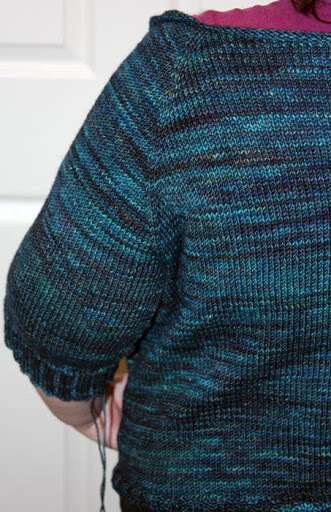 Then, I have to decide if I’ll add a pocket or not and then pick up and knit the ribbing on the front and back. All of this has been done in a week, and what a week it’s been. Ooof, that color is awesomely deep and gorgeous. Can't wait to see the full finished project! I love the color, the yarn too. Very nice !